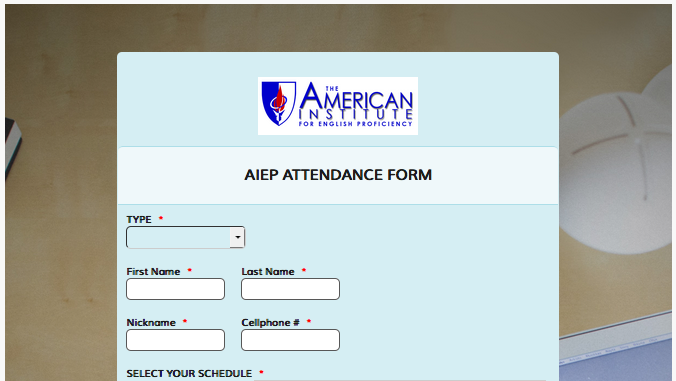 In order to give you a better learning experience here at the American Institute for English Proficiency, we will be automating the scheduling of your class attendance. Instead of putting your name on the sign-up sheet at the front desk, you will simply fill out an online schedule confirmation form. Please note that all schedules must be confirmed by 7pm. Students who do not fill out this form will not be permitted to attend class. In addition, to avoid class disruption, students who are not seated in class within 15 minutes of class start time will not be permitted to attend class. Please don’t forget that all confirmed classes are counted as used or consumed hours. It’s very easy to sign up for your classes. You can use a desktop or a laptop. Better yet, you can use your smartphone. Please do not email or text us with schedule as we are consolidating all attendance related matters on this form. Thank you. We want to make sure that all students can conveniently and easily sign up for classes. This process will ensure that your name will be on the confirmation or cancellation list so that we do not have miscommunication. To make this process a very easy transition for you, you can find the online schedule confirmation form at the bottom right of our website at www.aiepro.com by clicking on the CLASS SCHEDULE icon. You can also fill out the form here.